February 2015 Libra Horoscope predicts that majority of the planets are below the horizon towards the nadir in your natal chart. Astrology predictions show that during February 2015 the emphasis will be on improving your emotional strength. This in turn will help you to progress in all spheres. Planetary strength lies on the Western sector of your birth chart which indicates that you require the help of your social circle to progress further in your life. Librans in creative and academic fields, such as writers and students, will excel in their respective fields in February 2015. The career forecasts for Libra zodiac sign in February 2015 predict that progress in job and business will be effortless and will be with the grace of others. Unemployed people will be able to get good jobs during the month. The February 2015 Libra financial astrology predictions foretell that you will have a great month with booming income. This will be accompanied by large spending over buying gifts for family members. Money comes from multiple sources with the help of friends and family members. Love is in the air for the Librans in February 2015. Your partner will also be your partner in your financial growth. The alliance will be serious, and probabilities of culmination in marriage are great. This is also a good month to get pregnant. Family life will be one of celebrations with plenty of partying and social functions. Renovation and redecoration of residence is on the cards. 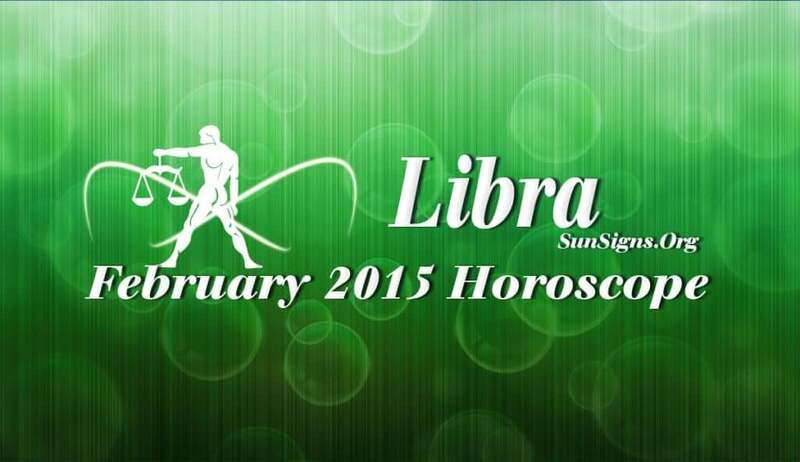 The February 2015 Libra horoscope foretells that your health will be splendid with plenty of energy and vitality.